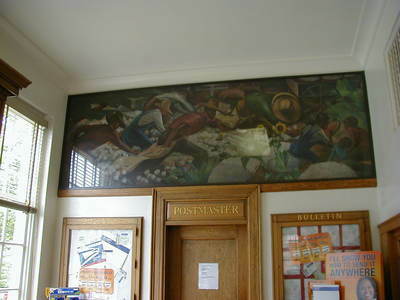 "Post Office (30462) Mural 1 Greensboro, GA" by George Lansing Taylor Jr.
United States Post Office mural located in Greensboro, Georgia. The oil on canvas titled "Cotton Picking in Georgia” by Carson Davenport was completed in 1939. The mural was funded through the United States Treasury Department, Section of Painting and Sculpture.